North winds at last! 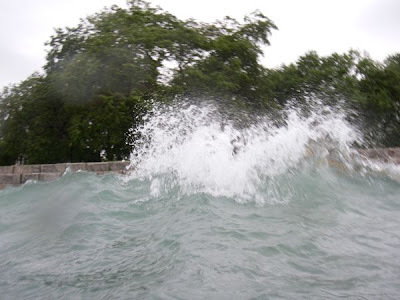 The forecast was 3- to 5-foot waves, so we hastened to the lake. 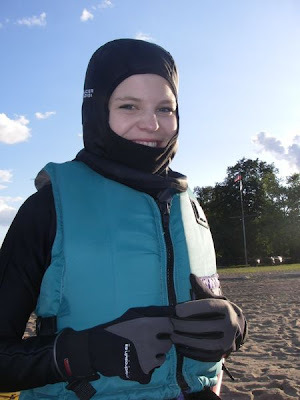 This time we wore drysuits, only to find that some of the surface water had returned and the water was relative balmy--somewhere in the mid-60s. We love practicing rescues, but don't often have an opportunity to try them in the conditions in which we're most likely to need them. (Especially this year, when we've had very few big wave days.) So we took turns putting each other and ourselves back in our boats. Alec and Hannah complete a t-rescue. Alec completes a scramble (cowboy) self-rescue. Every time we do this, we are struck by how well these rescues work in conditions, but how essential it is to move quickly and hold on to everything (boats, paddles, people). 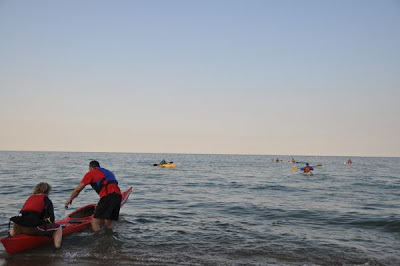 We typically teach rescues in calm conditions in which paddlers are unlikely to capsize and try to convince our students that in real conditions, any lapse of attention can lead to serious complications. If the rescuer lets go of the casualty's boat, it can whip away in the wind. If the casualty lets go of his or her boat or the rescuer's deck lines, they can quickly be separated. If anybody lets go of a paddle, they may never see it again. 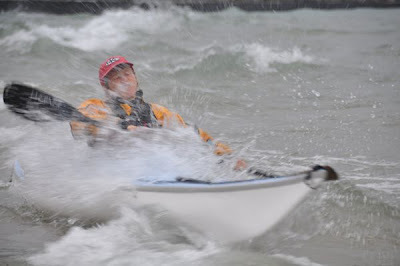 Working on rescues in real conditions is the best test of your technique. 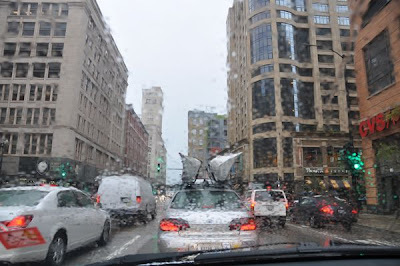 Every city seems to claim the saying, "If you don't like the weather, just wait a minute." 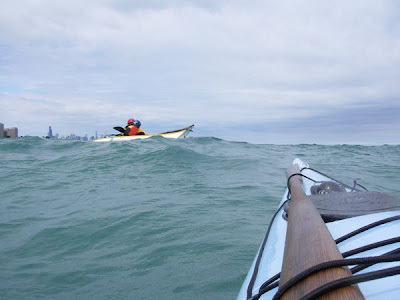 Here in Chicago, we can say, "If you like the water temperature, enjoy it while you can!" 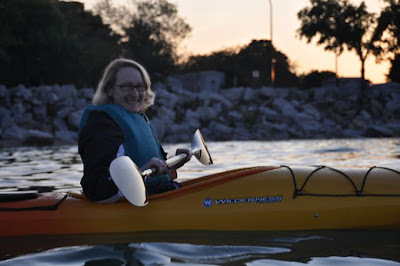 Two weeks ago, at the start of the Foundation Safety and Rescue Training class at Geneva Kayak Center Lakefront, the water temperature was a balmy 70 (or thereabouts). This week, it was in the mid-50s. Kaitlyn looking forward to repeat immersion in 55-degree water. 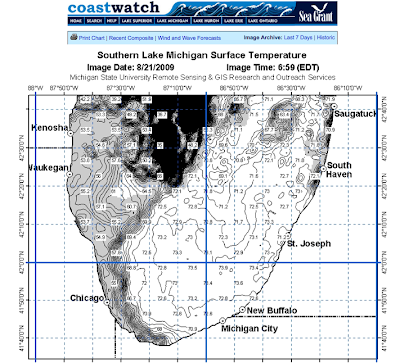 We've had westerly winds for the past few weeks, and they blew all our warm surface water over to Michigan. 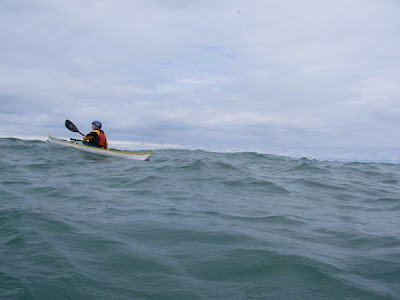 To all our friends in the West Michigan Coastal Kayakers Association: We don't like the water temperature! Send the warm stuff back! Ladies of the Lake is a unique symposium. Put on by Downwind Sports and sponsored by Impex and Werner Paddles, this all-female kayaking event features one day of local paddle tours, two days of instruction, a featured guest instructor, and a themed costume party complete with a raffle of gear generously donated by its host and sponsors. Grand Rapids-based instructor Lori Stegmier teaching a class on edging and bracing. There is something special about women-only classes. They tend to attract women who learn best in a supportive, all-female environment. Some are refugees from bad paddling relationships with men who have too much machismo. 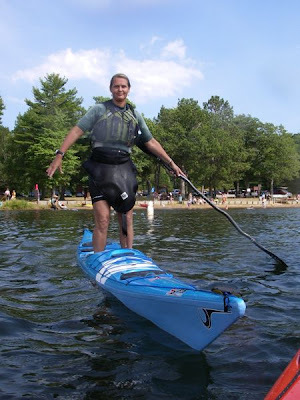 Some are looking for ways to improve their paddling that take into consideration female anatomy. Some are intimidated by men in mixed-gender classes. Some simply appreciate the camaraderie of gender-specific classes. A women-only symposium offers a weekend of immersion in these benefits. Participants get to watch each other and help each other improve over time. They aren't embarrassed about how they look as they attempt to scramble back into their boats. They don't apologize for their lack of upper-body strength. They eagerly adopt strategies that emphasize technique over muscles. In a rescue class, we teach the rescuer to wrap her body over the deck of boat. Strong men might get away with stabilizing the boat using only their arm strength, but that doesn't tend to work for many women. The midwest is fortunate to have a remarkable group of female instructors who are dedicated to making the sport accessible to women of all ages and abilities. That's the spirit of Ladies of the Lake. 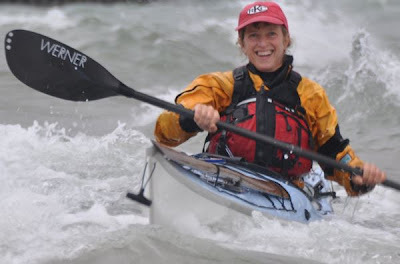 Chicago-based instructor Wendy Madgwick stands up for female kayakers everywhere. Getting on the water at the Big Rock Quarry. The forecast on Sunday was 94 degrees and sunny. A perfect day to either hide inside someplace air conditioned (library, movie theater, frozen food aisle) or go outside someplace wet. 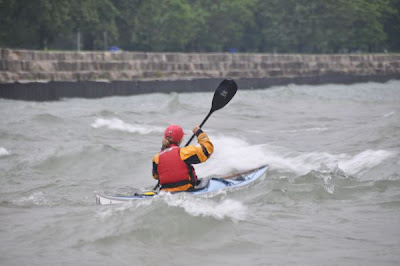 We were scheduled to teach a Level 2 class for Geneva Kayak Center at the Big Rock Quarry in Sugar Grove, so outside and wet it was. We love teaching this all-day class, which is typically the second class students take after a two-hour intro class. 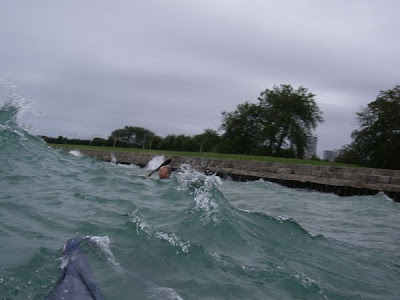 We start with wet exits, move on to basic strokes, and end with rescues. Students who begin the day fearful of falling over generally end the day feeling more in control of their boats and more aware of what they still need to work on and learn. They know enough to know that they know enough to be dangerous, which is a pretty safe place to be. 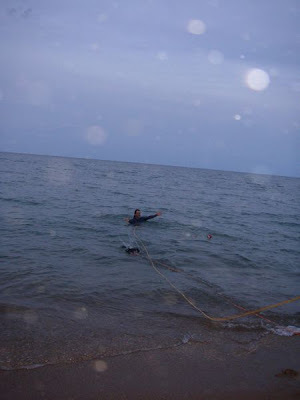 During Thursday's FSRT, Alec waits to catch a throw line and be towed into shore. 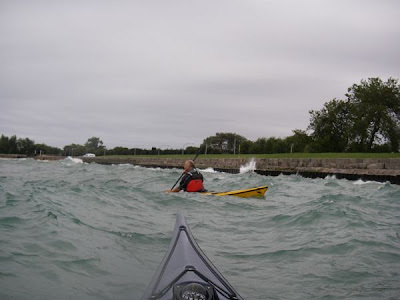 On Thursday, we assisted as Scott Fairty of Geneva Kayak taught Foundation Safety and Rescue Training, a prerequisite course for the BCU coaching track. 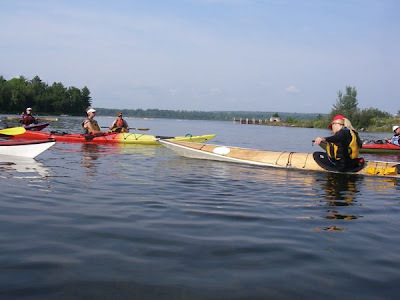 This is a fabulous course for anyone who intends to paddle a kayak or canoe on anything other than small, flat bodies of water. It covers all manner of rescues for all kinds of people and crafts as well as towing techniques. But beyond the mechanics of getting people back into dry boats, it covers incident prevention and management. 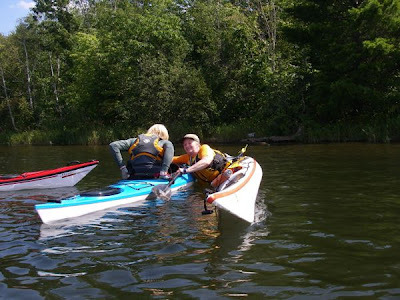 If a license were required for paddling, this could be one of the key required courses to prepare you to earn one. 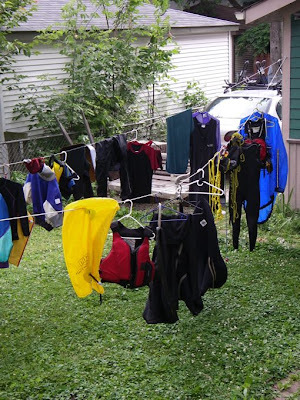 For years, our neighbors have patiently put up with our yard full of kayaks and drying gear. The way our yard typically looks. Actually, they've more than put up with it. 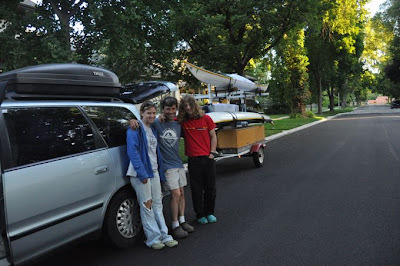 They've stopped by and asked us questions as we've loaded and unloaded our boats, and many expressed a desire to go out on the lake some day. The rig, ready to roll. Last night, we took 10 of our neighbors on a full-moon paddle. The conditions could not have been better. 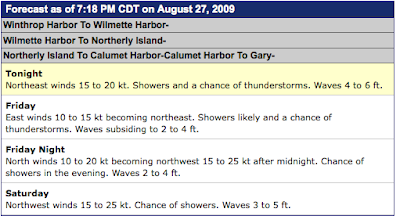 The air was in the lower 70s and the water in the upper 60s. The wind was calm and the sky was clear. Half way through our paddle, the moon rose above the horizon. It was magical. 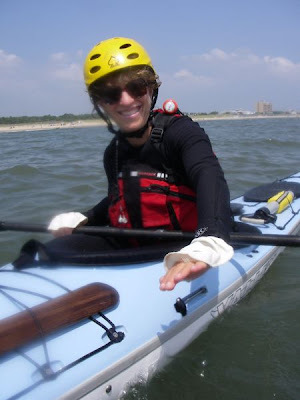 We were joined by fellow instructor Wendy (Bloyd-Peshkin) Madgwick, one of our partners in paddling crime. Matt and Annie, read to go. Joan and Gretchen, not nervous at all! Sharon helping Stephen get in his boat and on the water. Darcy, at ease in her boat. As we landed, we were greeted by Lyn (Bloyd-Peshkin) Stone, who couldn't resist the opportunity to see the moon over the lake even though she wasn't available to join us for the paddle. 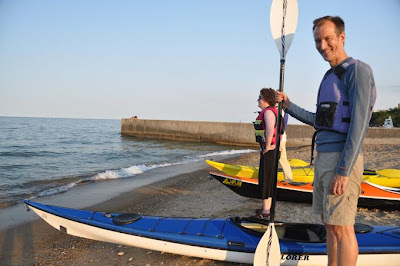 Then we loaded our boats and returned to Geneva Kayak Center Lakefront to eat some sweets and savor the beauty of paddling on Lake Michigan at night under a full moon. 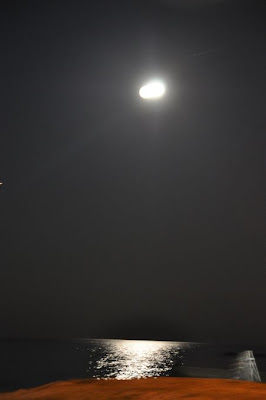 The moon after we got off the water, demonstrating the need for a tripod. 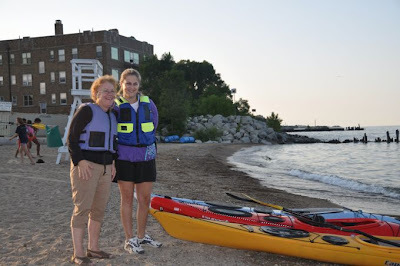 Thanks to our neighbors for sharing this evening with us, and a special thanks to Scott Fairty of Geneva Kayak for staying at work so late to make this possible! 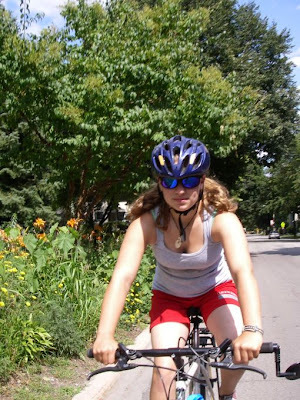 Bicycling and kayaking have a lot in common. They allow you to cover distance at a human-scale pace, enabling you to actually see and even engage with what you encounter on your journey from here to there. 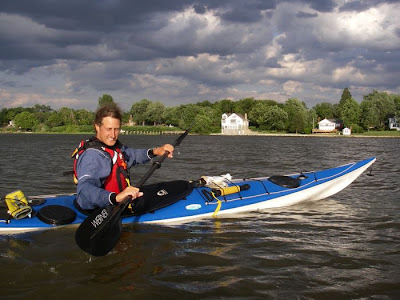 Many serious sea kayakers we know are former (or current) bicyclists. Both sports require a similar delight in repetitive motion and resilience to boredom. Hannah en route to the Prairie Path. A few days ago, we pedaled our bikes on the Illinois Prairie Path, a local rails-to-trails path. As you bike along this 61-mile path, you pass through small downtown business districts, past parks and gardens, over bridges and along rivers. You see kids on trikes and riders far more serious than you are on bikes. You pedal past walkers and joggers of all ages. 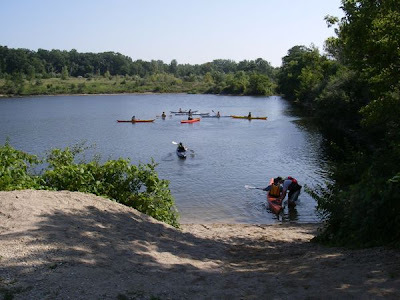 It's a magnet for people who need a quick dose of nature and some exercise. Along with Sharon's siblings, we've planted two trees along this path in honor of their parents on their 75th birthdays. Those are some of the best gifts we've ever given, and we suspect among the best gifts they've received. Here comes the storm! Our last day at Adventure Crafters 2009. 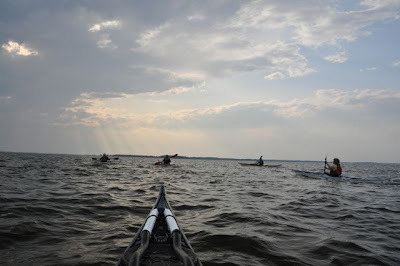 The day before we left Maryland, we decided to go for one last paddle with Robert. It had been a hot day, and building cumulus congestus clouds suggested a short window of opportunity. 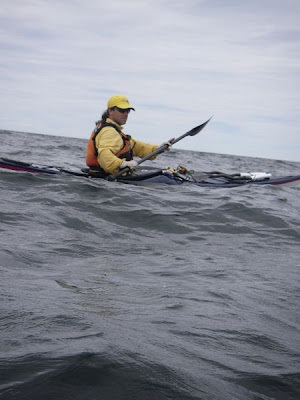 So we chose a nearby put-in with a really short carry and hurried to the water. 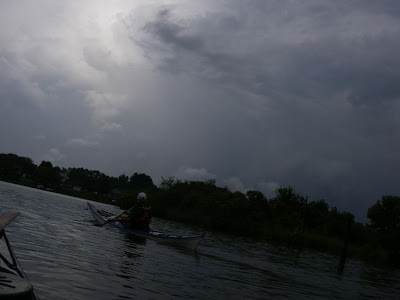 No sooner had we unloaded the boats, geared up and gotten on the water than we heard a loud thunderclap. Looking back, we saw towering cumulonimbus clouds moving in, and then lightning. We immediately got off the water. 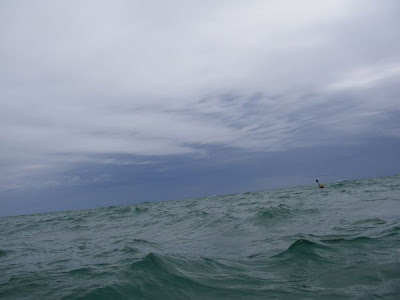 We seem to have a pattern of paddling as thunderstorms move in, particularly when we're paddling with Robert. Storm moving in. Adventure Crafters 2008. The day before we were scheduled to teach a leadership and rescues class at Adventure Crafters, during which we planned to teach towing techniques, we went for a social paddle with co-owner and instructor-in-chief Robert Schrack. We were talking about classes we've taught and tours we've led when Robert introduced us to a term we didn't realize we had been lacking: the "psychological tow." 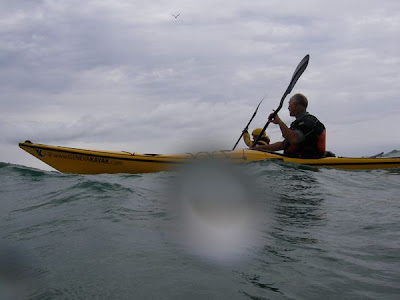 If you're an instructor or guide, or simply a skilled paddler who has taken less experienced people out on the water, you'll immediately know what this means. Frequently, somebody becomes overwhelmed by conditions. 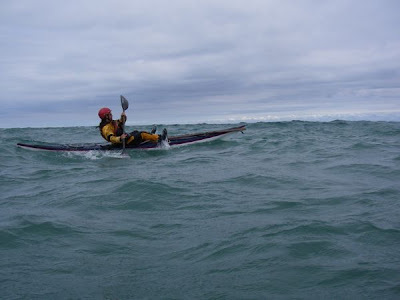 They may be freaked out by waves or wind, or simply tired out by too much exertion, and they need some help to complete the planned journey. You could tow them, which would be more work for you and might be humiliating for them. But in the case of bumpy water, that might make things worse. So instead, you coach them. "Keep going," you say. "Keep your hips loose. That's great. Keep paddling. Nice work. It'll be easier if you get your entire blade in the water." You instruct them a bit, encourage them a lot, and distract them. "You know, the bar lakes along this shoreline were once small bays...." You blather on, paddling close to them and sounding relaxed, offering a mix of small talk and advice, and they manage to make it on their own. That's the psychological tow. Having a term for it is not only satisfying, in the same way as knowing the names of birds or mushrooms. It's practical. By placing the psychological tow in the category of tows, it reminds us to try this first before a more invasive intervention.